Due to uncontrollable financial hardships, many residents in Arizona and other states are experiencing their own personal debt crisis and considering getting loans to help. In many cases, these consumers have been forced to depend on their credit cards to pay for essentials like food, clothing, or utilities. As a result, many consumers are struggling with high credit card debt and are falling several months behind on their payments; a situation that can certainly lead to bad credit ratings. If you are also experiencing your own debt crisis, you can breathe a little easier because help is available--in the form of debt consolidation, debt settlement, or even loans. If you have ever come across the term "credit counseling" and wondered, "Is that the same as consolidating my debt?" then you're already on the right track. As you may have guessed, debt consolidation, or credit counseling, allows consumers to combine multiple credit card and unsecured debts into one, easier-to-manage, and simplified payment made to a credit counseling agency. While debt consolidation has certainly helped many consumers in debt, there are alternatives to this approach. Depending on your situation, your other debt relief options may also include debt consolidation loans and debt settlement. Like debt consolidation, debt settlement and loans have become popular alternatives to bankruptcy--which has a more damaging and longer lasting impact on personal credit. 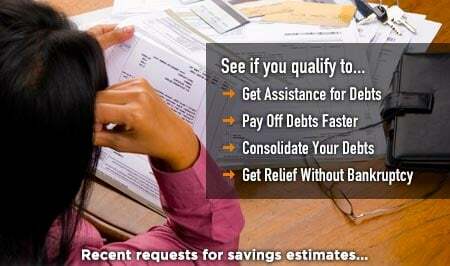 To find out how much debt relief can save you, request a free debt relief analysis along with a savings estimate--at no obligation to you. Often, when given the choice of dealing with multiple payments every month or having just one payment to worry about, many consumers choose the latter. That is generally the idea behind debt consolidation or what is also known as a debt management plan (or DMP). Debt consolidation allows you to combine, or "consolidate," multiple credit card and unsecured debts into one, more structured, and more manageable monthly payment made to a credit counseling agency. When you enroll in a debt consolidation program, credit counselors review your finances--taking into account your debts and source of income. Once they determine how much money you can reasonably allocate to paying off your debts, they will typically develop a strategy, submitting proposals to creditors asking for reduced interest rates, or the waiving or elimination of any late fees or penalties. Creditors that agree to the proposals are placed into the debt management plan. "What Are Debt Consolidation Loans?" Many consumers in Arizona apply for debt consolidation loans to help pay off their credit card debts and other types of unsecured debts (such as medical bills, retail store charges, or even utilities). With their reduced interest rates, debt consolidation loans can certainly help many individuals trim their debts because they have, ideally, combined all their high-interest debts into one, lower interest loan. However, debt consolidation loans can be risky: Debt consolidation loans typically involve taking unsecured debt and paying it off with funds that come by way of a "secured" loan, meaning, it is generally a loan where you would have typically put up your home or other asset to get approved. If, for any reason, you fail to make your loan payment, you would have essentially put your home at risk. In many cases, consumers who get debt consolidation loans also end up using their credit cards again and ringing up new charges. As a result, many of them will have new, high-interest credit card debts to deal with on top of their loan. Under this scenario, a debt consolidation loan has generally not provided relief but made their debt situation go from bad to worse. "How Does Consolidation Compare with Loans?" While debt consolidation and debt consolidation loans can both provide relief, the process in which they help you pay off your debts may vary. As mentioned earlier, with a debt consolidation loan, the goal is to combine high-interest credit card and unsecured debts into one, lower interest loan. Since it generally means taking unsecured debt and paying it off with funds that come by way of a "secured" loan, you could be putting your home or assets at risk--should you default on the terms of your loan agreement. 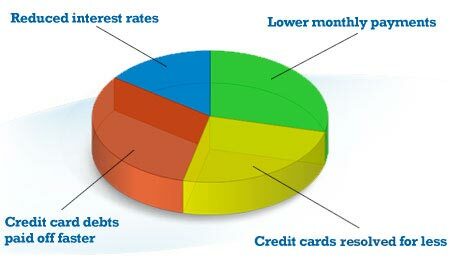 In contrast, with debt consolidation, you are typically combining or consolidating credit card and unsecured debts into one, more structured, and more lenient monthly payment made to a credit counseling agency. The goal of debt consolidation is, with a single, more structured, and more affordable payment plan, you can, ideally, reduce your debts sooner than if you continued making the monthly payments on your credit card debts at higher interest rates. It stands to reason then that for many consumers, debt consolidation, if followed faithfully, may be a preferred way to pay down debts at a more predictable pace. Compare your debt relief options today by taking a minute to answer just a few, simple questions and request your free debt relief analysis and savings estimate. Start today! Copyright © 2019 ArizonaDebtRelief.org, All Rights Reserved.